Another day at the strawbale home which is nearing completion! In some ways it is completely gratifying to actually see how beautiful the finished walls look- just like pictures from one of the books on my shelf at home, but a certain sadness (for me), that these fun Sundays will soon come to a close. I am sure it cannot come fast enough for Peter and Tash (the owners and builders) who are expecting their first baby in less than two months. 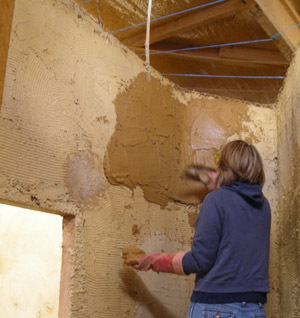 This weekend I spent time sponging one of the internal walls, getting it pretty much to 'completed stage'. 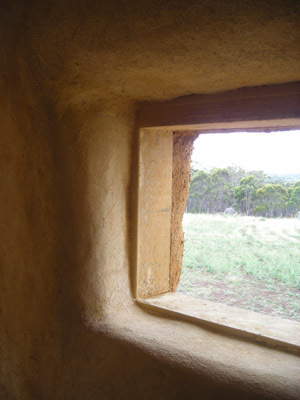 This lovely, meditative job involves gently rubbing a sponge over the render to take off loose particles and small stones, and smooth over ridges so that the wall takes on that uniquely 'strawbale' organic finish. The other job I got to try out for the first time was trowelling (see Jo at work right). This is manually spreading the final coat of render on using a trowel, before the sponging follows when the wall is half dry. Too wet and the sponging takes off too much of the render, and too dry, and you've missed your opportunity to sponge! Got to get it 'just right'- just like porridge!